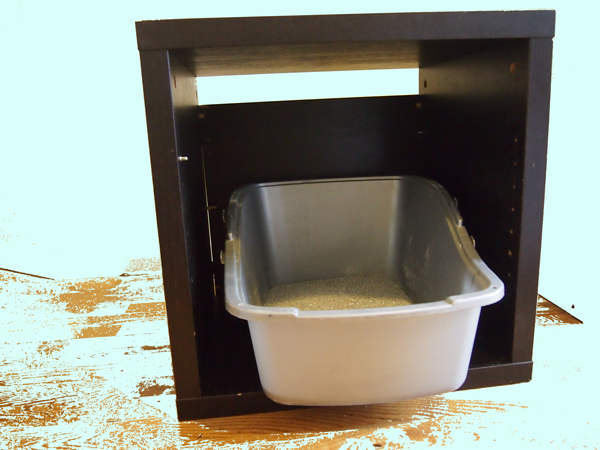 When you don’t have $100 for a hidden litter box…Above is the inspiration for my Ikea kitty hack– it’s the Petsfit Pet House Litter Box Enclosure Night Stand. Note: Since publishing this post, many reasonably priced (and decent looking) hidden kitty litters have hit the market. Check out the latest hidden kitty litter roundup here. Unimpressed by the steep prices and terrible designs of hidden kitty litter boxes available for purchase, I decided to take matters into my own hands and went straight to Craigslist. I found an Ikea “Corras” side table for $15 and immediately saw its DIY potential. Since I originally wrote this post, Ikea has retired the Corras table but you could do the same thing with this Ikea Rast nightstand or this South Shore nightstand. The entire construction time came in just under 30 minutes and cost less than $20. And this is how I made it… I removed the four casters by removing the screws fastening the casters to the underside of the table. Then I made the shelf into a door by attaching two hinges to the front of the table (see top photo for reference). 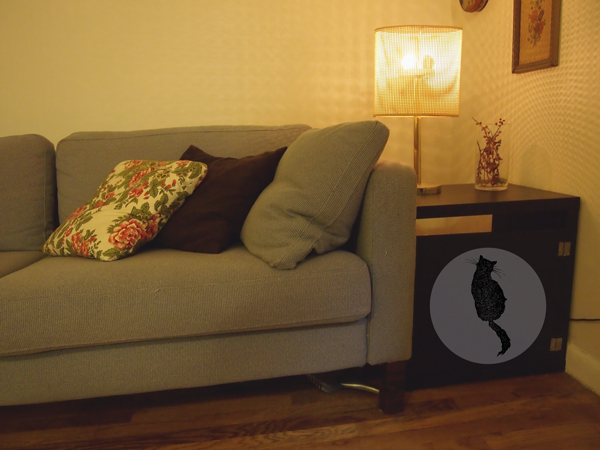 Since the shelf came with the table, it was a perfect fit– no need to trim or resize. I didn’t mind the visible hinges, but you could buy hidden cabinet hinges from the hardware store. This setup is really the best thing out there if your cat is somewhat flexible with their litter situation. The pellets are a bit different from traditional litter materials, but my cat caught on immediately. The Breeze Litter box is relatively small and still fits in my kitty-hacked side table. The Amazon reviews are really helpful in deciding if this would work for your feline situation. You’ll also want to follow some or all of the recommended transition steps.